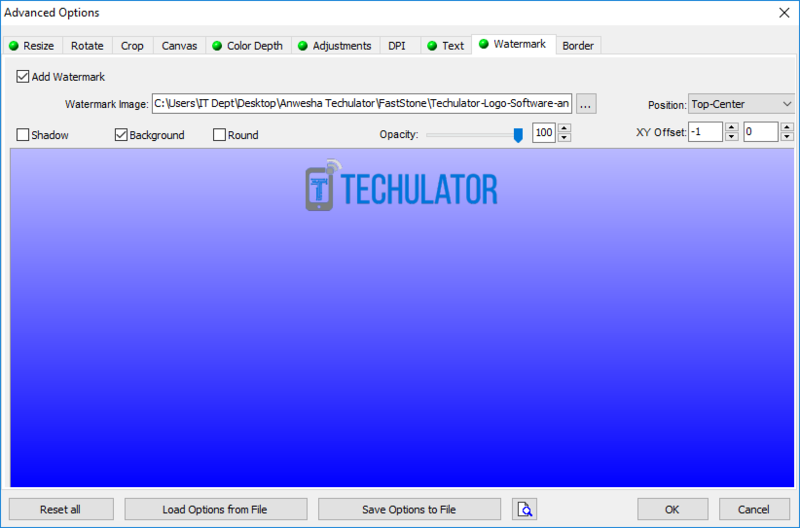 If you are a Windows user and looking for a robust and efficient utility tool that can help you resize and rename your favourite images in batch mode then FastStone Photo Resizer can come handy for you. Read on to know more. It's not uncommon these days to have your PC bloat with tons of photos and images that after a certain time become unmanageable. The easiest and most convenient way these days is to archive your images in a cloud storage such as Drive from Google, Dropbox or tens of other image hosting sites that allow you to store, process and share your images with rest of the world. However, they all come with space or other limitations. Because of this, quite often many users prefer to retain them on own systems even if this means resizing or changing the resolution of the images to make them smaller. Simultaneously, one might even want to rename the images in a certain way and add watermarks. Doing this one image at a time is a laborious task and in such cases, a utility or tool that can process your images in a batch would come in most handy. Let's look at one such nimble application that stands out among the many image resizers out there and could help you achieve this effectively and efficiently. 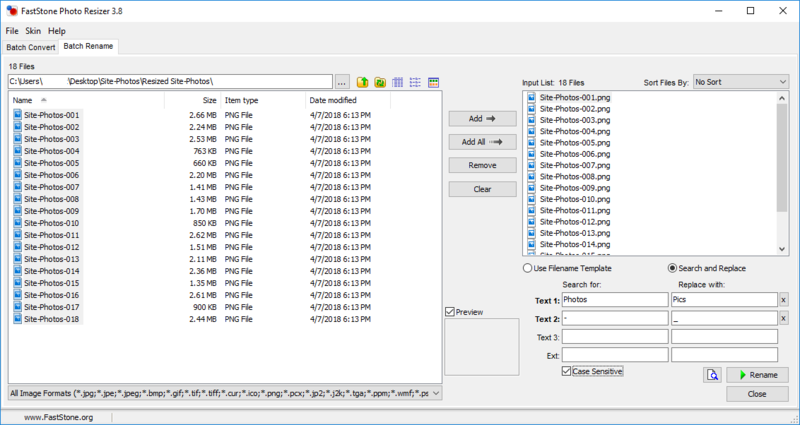 The FastStone Photo Resizer from FastStone Soft, a group which is involved in research and development of image processing tools for free and commercial use, is one such tool. This is a freeware utility that allows one to convert and resize your images, crop out areas not needed, change the resolution, change the orientation or rotate the images, rename images, change colour depth and add text or watermarks to tons of images at a time in batch mode using drag and drop operation. Some of the more advanced functions include salient features that allow sequential numbering and search and replace operations in the file names during batch renaming. This is handled with precision by this robust application which also supports folder and non-folder operations. Let's check some of the basic functionality provided by this photo resizer. 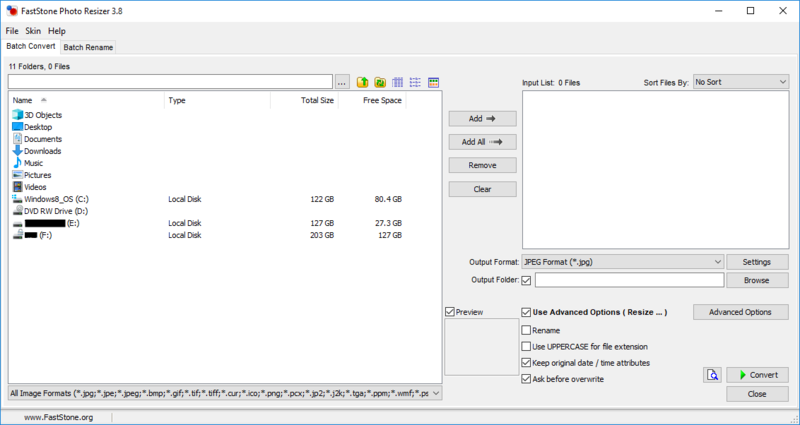 Installation of this utility is a breeze with the executable that can be downloaded from the FastStone website (http://www.faststone.org/FSResizerDownload.htm). The executable would do the job for most users, but other options for users restricted by their network are to download the archive (.zip) which can be extracted and a standalone or portable zip which can be used to run the application independently from a folder on your PC without installation so that you can even run the application from within a USB Pen-drive / Memory stick if required. Since the software is Freeware, its free for personal use by home users. You will need to register with FastStone Soft if you intend to use for commercial purposes. The best thing about this utility is that it contains absolutely no Adware or Spyware and won't pester you to enable any additional 3rd party components or throw an offer at you during the installation process or afterwards. Once installed, launch the application using the shortcut created on your desktop or by navigating to the folder where it was installed and clicking on the FSResizer.exe utility. It will display the initial application screen which is intuitive and easy to use. 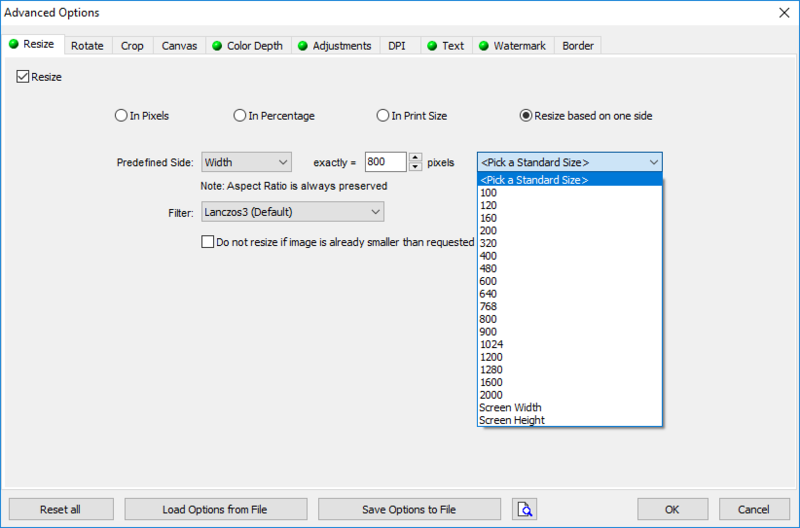 Let's take a look at how you can go about your first batch resizing. The interface is pretty simple and consists of two main tabs that let you achieve a lot of things with your images. The two tabs, namely the Batch Convert tab and the Batch Rename tabs more or less display the same layout. You have the list of drives and folders on the left. 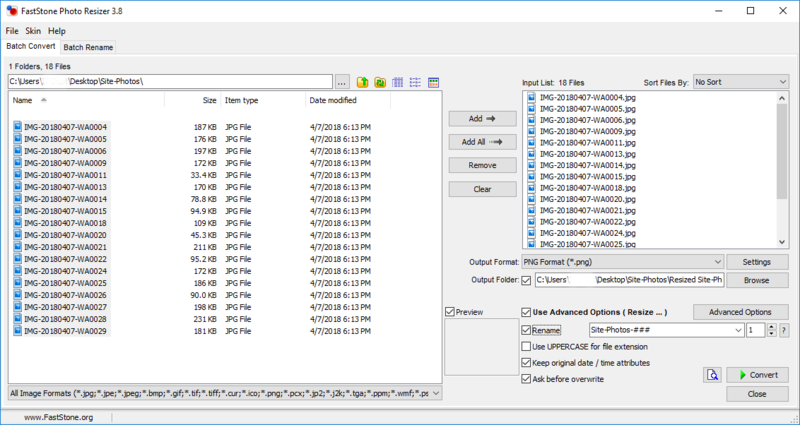 You would be using the Batch Convert tab to perform functions such as converting images or resizing them and the Batch Rename tab would allow you to perform the renaming operations. However, you also have the additional functionality to rename the images as well when you perform a batch conversion. 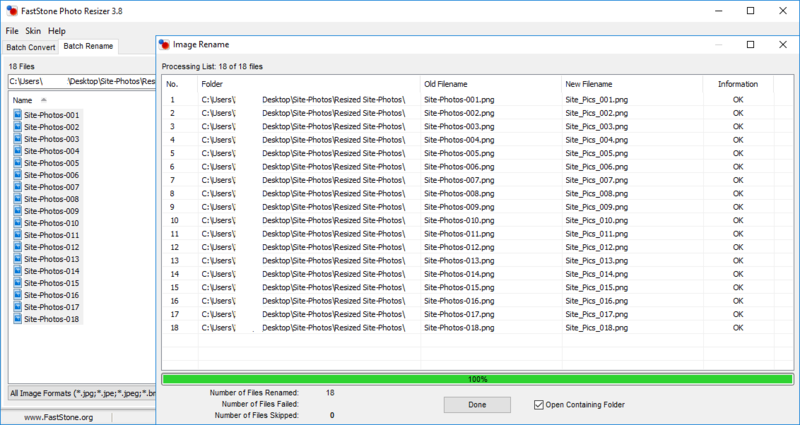 To do a simple batch conversion, firstly browse to the folder where you have stored all your images. The list of images you have in the folder is listed on the left. You can now select the images, one or many at a time and use the add button to add them to a processing list on the right. If you want to work with all the images in the folder, simply use the Add All button which will enlist all the images in the folder in the process list. Next, you can choose the output format if you need to change the format – for instance from .jpg to .png if required. Then you can select the Output Folder. This is where the converted images will be stored once the processing is done. If you choose not to change the folder, the images will be stored in the same folder. If you don't choose to rename them on the go, the older images could be overwritten so one has to be careful with the selection. Further ahead, you have the Advanced Options using which you can perform actions such as selecting the output size of the images, orientation and colour depth, DPI and many other features. For resizing, you have to click on the 'resize' tab and click the checkbox to expose the resizing options available. This provides options to resize based on height and width in Pixels, in Percentage, in Print Size, or based on One Side, which is one of the most suitable and safest options when resizing images as when the width or height is selected, the other gets proportionately adjusted automatically. The ability to add Text and Watermarks are remarkable features to go with as you have the ability to add image watermarks such as a logo and also text watermarks. Other options you can explore are rotation, cropping, changing the canvas size, adjusting the image brightness, contrast, gamma, saturation and sharpness, all of which put a lot of power in your hands to work with. Click 'Ok' to finalize the items you have changed. Finally, you can use the Rename field to rename the image using the required string plus number notation for sequential numbering. For example, if the original images have a name format such as 'DSC9999', you can change it to 'MyImage_##' where the '##' will be replacef by number starting from '01'and so on till the end of the queue is reached. Of course, if you choose not to rename, as mentioned above, make sure the output folder is something other than the original one else the original images could be overwritten irreversibly. Once you set the other simple options you can click 'Convert' to start the batch conversion process. 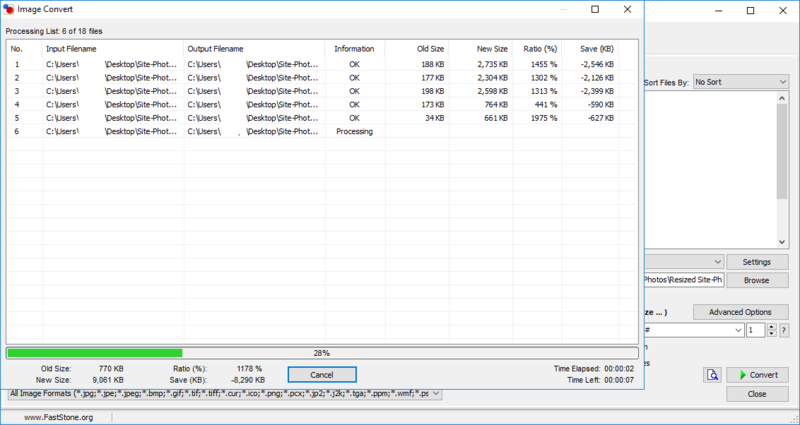 This launches a window that displays the ongoing conversion process and stats such as the amount of compression or expansion is done on the image, the effective size savings and notifies you once done. You can now choose to continue working or simply exit the application by clicking the 'Close' button in the bottom right. The File Renaming tab is just as powerful and provides options to rename files based on a filename template such as 'Image#####' where the '#s' will be replaced by sequential numbers, or you have a powerful search and replace function using which you can find instance of text strings in the file name and replace them with strings of your choice without effecting other characters in the file name. For example, you can easily find all instances of 'DSC' anywhere in a filename and replace with anything you want. Once you provide the change parameters such as the text and extension to be replaced and the text to replace with, selecting whether the search is case sensitive you can click the 'Rename' button to start the process. You will be asked to confirm your changes and once you accept, the application will launch a window that shows the progress and notifies you once done. You can now happily go about resizing and renaming your images with no limitations in this powerful freeware utility. One slight improvement that could be brought about in the system is providing a step by step wizard. Though the layout is quite intuitive the learning curve for basic users might be a bit high. This is, of course, made up for by the 'Help' feature which can be invoked using 'F1' or clicking the '?' icon provided beside items such as the string structure in the rename field. 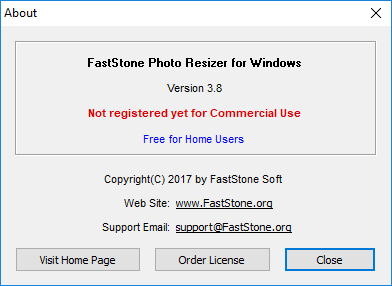 The FastStone Photo Resizer is now almost over a decade old but is still one of the best PC utilities going around. The freeware is limited to personal and non-profit use, but the licensed version is not too expensive at USD $19.95 for a lifetime license and allows for commercial usage and a sweet deal with free upgrades.